Jan from the International X-Plane Engineering Group has posted another development update from the 737-300 for X-Plane. Flight Replicas has posted more details and preview screenshots from the upcoming Messerschmitt Bf-109K for FSX. Paulo Ricardo has posted more preview screenshots from the upcoming Rio de Janeiro 2012 photo scenery for FSX. The FlightZone 02 Portland Intl. Airport (KPDX) scenery is being converted for use in FSX. Details and Pictures. Taburet has released the Dresden Photorealistic scenery for X-Plane 10. Now available to purchase at SimMarket. SunSkyJet has posted more previews from the soon to be released Philadelphia Intl. Airport (KPHL) scenery for FSX. Marcel Felde has posted another teaser screenshot from the Pilatus PC-6 Porter currently under development for FSX. InterSkyStudio has released the freeware Kiev Boryspil International Airport (UKBB) scenery for FSX and FS2004. LatinVFR has posted more FSX preview screenshots from the upcoming Cozumel International Airport (MMCZ) scenery. FSDreamTeam is offering 30% discounts on all sceneries for current Ground Services X customers. Until July 4th 2012. Flight! Magazine - Issue 06 2012 (german language only) is now available at the Flight! Magazine Website and SimMarket. Drzewiecki Design has posted more development screenshots from the Warsaw City 2012 scenery for FSX and FS2004. Carenado has posted more previews screenshots from the upcoming Cessna C208B Grand Caravan for X-Plane. Vassilios Dimoulas has released the freeware Polk City (FA08) Fantasy of Flight Airport for FSX. Download at AVSIM. Aviation Multimedia Studios (AVS) has posted details and screenshots from the upcoming Cancun 2012 (MMUN) for FSX. Aerosoft is offering 20% discounts on select sceneries during the Midsummer Sale. Valid through June 25th 2012. FS Recorder 2.18 alpha for FSX and FS2004 is now available for download in the FS Recorder Forums. The Microsoft Flight Team has released another update to Microsoft Flight. Changelog is available in this previous post. The freeware Robin DR.221 Dauphin for X-Plane 10 is now available to download at the XPFR Website. The freeware L'Aigle St-Michel Airport (LFOL) scenery for X-Plane 9 & 10 is now available to download at XPFR. Shade Tree Micro Aviation has released version 1.17 of the Tracker XP headtracking software for X-Plane 9 & 10. - TrackerXP will automatically detect the CameraID for Windows in most cases. - A new view with realistic "out the window" parallax effects. Great for small GA aircraft and heli's. - Arrow keys move POV in all TrackerXP views. - Assigned 'w' key to reset POV to startup position. - Custom commands to access all X-Plane V9 and V10 view functions. - Turn the Zoom OFF, if desired, from the TXP Preferences Menu. - Run TrackerXP "wide open" with a Null Zone of 0. Freeware Copalis State Airport (S16) scenery for Orbx FTX North America PNW or PNW Demo at Simviation. 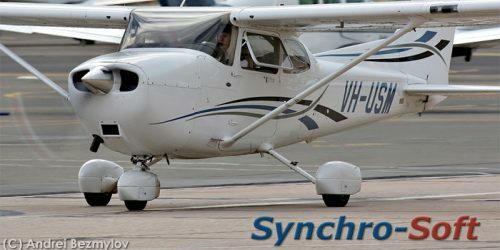 Synchro-Soft has released the Vintage Cessna C172 Soundset Version 2 for FSX. Available to purchase at SimMarket. Taxi2Gate Toncontín International Airport (MHTG) is now also available for FS2004. Details and purchase at SimMarket. France Touristique Scenery has released the Dzaoudzi Pamandzi International Airport (FMCZ) scenery for FSX. - More than 90 3D objects, modelizing in detail the infrastructures and other purposes of the aeronautical - environment of the grounds concerned. - Night textures and light effects. - Virtual traffic general aviation. - AI traffic compatible with the paying and free products such as WOAI. - Maps of the SIA: VAC - IAC - ARRDEP - ENROUTE. Pacific Islands Simulation has posted this promotional video of Xiamen International Airport (ZSAM) for FSX. PC Pilot - Issue 80 - July/August 2012 is now available to purchase at the PC Pilot Website. Outerra has posted a progress update from the Outerra Terrain Engine currently under development. - Changed external model canopy glass reflection to get rid of separate DX9/DX10 models. New glass material (textured) looks OK in both modes. Orbx has posted first previews from the upcoming freeware West Wind Airport (7WA3) for the FTX PNW region. A_A Sceneries has posted more previews from the upcoming Macau International Airport (VMMC) scenery for FSX. GrandSurf has posted new screenshots from the upcoming Oakridge State Airport (5S0) scenery for FSX and P3D. Flight One Software is currently offering $20.00 off FS Global 2010 X for FSX as the Weekly Special. More preview screenshots have been posted from version 2.3 update to Ground Environment X (GEX) Europe. Aerosoft has posted preview screenshots from the upcoming FSX version of Yekaterinburg Koltsovo Airport (USSS). Alabeo has released the long-awaited Cessna 188 Crop Duster for FSX. Details and purchase at the Product Page. - Chemical fumigation liquid effect. - Real weight reduction as you drop chemical liquid. - Material shines and reflections. - High quality 3D model, textures and sounds. Aerosoft has announced the upcoming freeware Mitchell Wing for FSX. Details and previews in the Aerosoft Forums. The Microsoft Flight Team has posted more screenshots from the upcoming Alaska DLC package for Microsoft Flight. The recently released UK2000 Glasgow Xtreme (EGPF) V3 for FSX and FS2004 is now also available at SimMarket. - New High res ground images. - New changes to actual airport buildings. - Existing building textures touched up with shading effects. The recently released Flysimware Cessna 195 for FSX is now also available to purchase at SimMarket. FlightGear has has updated the world scenery database to version 19902. Details at the FlightGear Website.